While the beef is cooking, cut the zucchini and summer squash into small, 1/4" - 1/2" cubes. Pour about 1/2 of the tomato sauce mixture into a 8" x 10" casserole dish. Place 3 of the lasagna noodles on top of the mixture (breaking each one in half if necessary), pressing each one down so that it's covered with about 1/4" of the tomato mixture on top. 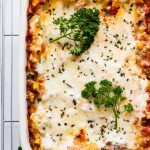 Love easy and healthy recipes like this lasagna? Be sure to check out A Month Of Healthy Eats For The Busy Girl! How much sodium in this recipe? Hi, Linda! Unfortunately I do not have that information at this time. Thank you so much for this recipe. Made it, hoping my girls would eat it (3 and 7) and they both gobbled it up!! So delicious!! Will definitely be checking out your other recipes! Is it possible to prep it all and store it as a meal prep to be microwaved every night, for 5 days?